KANSAS CITY, Mo. (AP) — There could have been some infighting when the Detroit Tigers were languishing below .500 midway through the season, or even when they trailed the Chicago White Sox deep into September. This was the team, after all, that won the AL Central last year, and was only supposed to get better with the signing of Prince Fielder. But the lofty expectations out of spring training had been long forgotten by everyone outside the clubhouse, the season so often close to being written off. Then the White Sox started to falter, the Tigers finally started to play defense, and all the pieces came together for a joyous ride that ended in a raucous celebration Monday night. The Tigers, paced by MVP front-runner Miguel Cabrera, beat the Kansas City Royals 6-3 to clinch back-to-back division titles for the first time since the 1934-35 seasons. They’re just as likely to come out swinging, too. 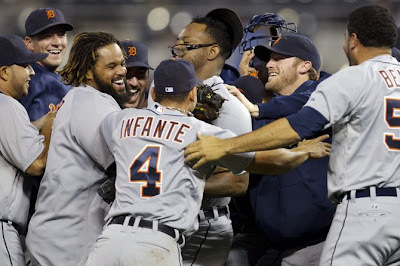 Cabrera had four hits on the night, including a homer during a decisive five-run sixth inning, to prop up his chances of becoming the first Triple Crown winner since 1967. Gerald Laird added a bases-loaded double, Rick Porcello (10-12) pitched shutout ball into the sixth inning and Jhonny Peralta went deep off Bruce Chen (11-14) to give the Tigers a big lead.